I had never been in a trailer park before, at least that I can remember, but I have watched episodes of Netflix’s Trailer Park Boys, as well as every single episode of Breaking Bad with Walter White in his 1986 Fleetwood Bounder encapsulated meth lab on wheels. So I readily agreed when my friend Jim asked me to photograph some of his Florida parks. I also accepted because I know that Jim is an enigma to the typically absent mobile home park owner who is driven purely by vast profits derived from curtailing expenditures on park necessities. He proudly takes extreme care of his parks, employees and residents. He visits his parks regularly to maintain the best possible standard of living and he invests in infrastructure and programs for the residents. He is starting programs to promote reading readiness for smaller children and to make college a realistic priority. While I did this photo journal for free, I would have paid for the opportunity to photograph these communities. Photos by Robert Levy taken during his trip through mobile home parks. We headed to Florida without any confirmed plan other than renting a car and visiting a long list of parks. Just two middle aged, moderately experienced family guys on a road trip. Our three and a half day 320 mile journey began in Miami visiting parks up the east coast to Cocoa, then a leftward turn to Tampa. We hit a total of 23 parks that had an average of 387 trailer pads each. The typical single wide mobile home is between 600 and 1,330 square feet, which makes a person prioritize with great care which items to keep. Conspicuous consumption must be redefined when the space to keep possessions is so limited. 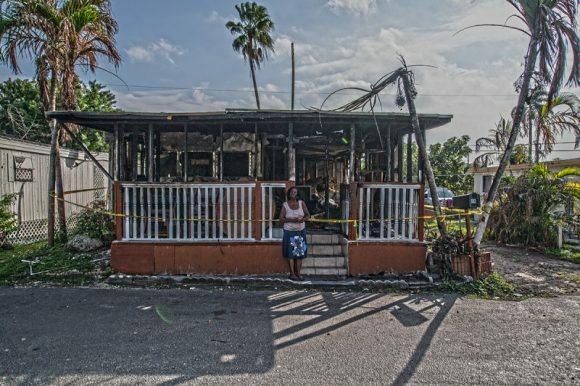 It takes a mere five minutes for a mobile home and its contents to be completely destroyed by fire. I spoke with the residents and managers of every park. People who ranged from park lifers in the mobile home parks to the eternal transients and snow birds in the RV parks. 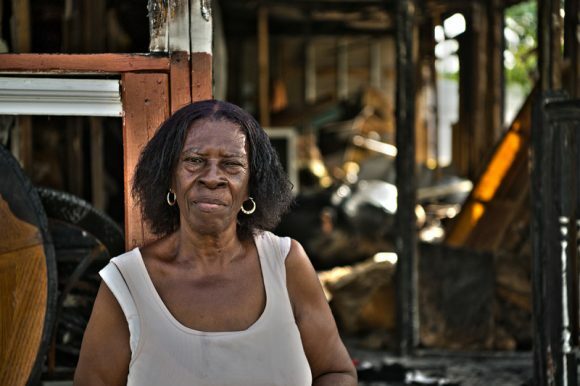 One woman had recently lost her home and all of her worldly possessions to a fire. Fortunately, insurance proceeds will be enough to buy a used $2,500 replacement home. It will be devoid of her cherished items turned to ashes, but she will be able to live once again near her children and grandchildren. I watched a park manager guardian over children while parents were at work. The love, adoration, care and connection between the children and park manager was heartfelt and as close as any nanny would be with her charges. I experienced tightly knit, highly concentrated protective trusting communities. I met an older couple who purchased a used 1972 GM Buffalo bus 35 years ago and have travelled the country in it ever since. He used to rebuild National Acme screw machines in Ohio. Now retired, he travels the USA from one RV park to the next with his wife reloading hunting bullets on his portable RCBS A3 reloading press. They collect stories and memories of their journey, rather than molecular possessions. Their bus is adorned by the trophies of their journey including numerous photos and deer antler door handles. One little boy got very excited when I asked his parents if I could take a picture of him in his complete outdoor Toys “R” Us plastic kitchen. His pure innocence and joy were evident in his torqued little fingers and the intensity of the smile on his face. All was not idyllic however. One park tour was abruptly interrupted by a police stakeout for a breaking and entering robbery for which the suspect was under pursuit. A woman found a burglar in her trailer stealing her flat screen TV. The streets were cordoned off as the police laid down portable tire puncture strips to catch the thief. The police chief and the park manager had a casual and friendly familiarity and their actions seemed precisely well rehearsed to indicate that this was a routine occurrence in this particular park. Luxury is a relative concept. There is as much pleasure in plastic, plaster and concrete for some as there is in gold, crystal and champagne. I captured images of children playing soccer on the narrow paved paths between homes as happy as anyone I have ever seen. I spoke with one single mother giddy with excitement as she had just closed on the purchase of a home regaining her independence. Of the nearly 1,600 images captured, I whittled them down to 275 workable photos that captured the true essence of what was plainly visible to the naked eye, but more importantly, the essence of the atypical daily lives of nearly 20 million Americans who inhabit an estimated 8 million mobile homes. I was most moved by the sense of community, enjoyment of life and the beauty of that which has been created by the pride and commitment of the residents, management and ownership of these parks. There are images that you will like, hate, be moved by and not identify with. That is OK because what I began to realize as I worked on the photos was that this series of images, which was originally for my friend, became more for me. Question: Do you want to live in one spot when you retire? Robert Levy has been a prominent auctioneer living in Detroit for the past 30 years. Photography is one of his passions. Hello – I hope you were able to visit some of the nicer/newer mobile home parks that Florida boasts. 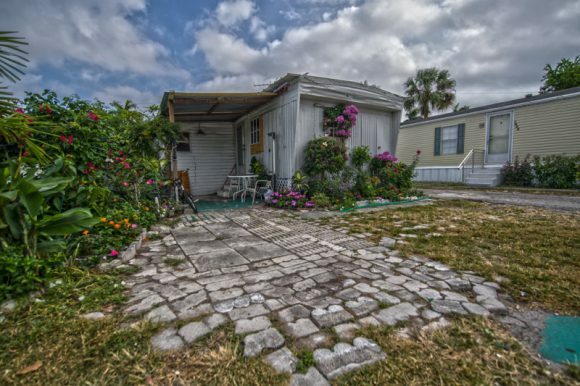 I plan to live in a 55+ Florida mobile home park when I retire next year. I currently live in a very nice 55+ community of 1000 homes in Northern Ohio, and each home has enough grass around it to require a mower along with room for flower beds and even vegetable gardens. Each of us has a shed for storage, a patio for summer enjoyment and, for some, screen porches. There’s a community room for group gatherings and activities. It’s well maintained by our park owners and residents alike. 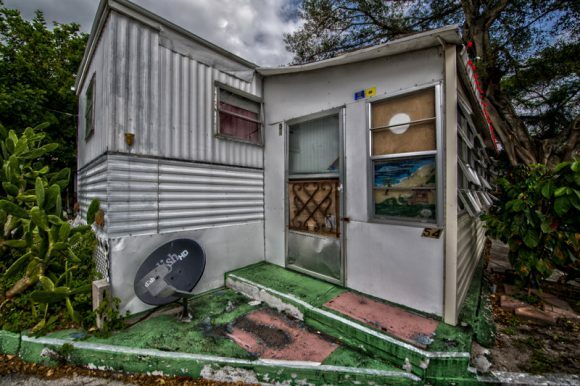 Unfortunately, your pictures don’t do justice to the up-to-date mobile homes available. I wish you had been able to show more diversity in your article. Are newer/nicer mobile home parks that common? I’m sure they exist, but I wonder what percentage of parks in the U.S. are for well-off retirees. My guess would be not many. I would very much like to visit parks that you describe. I did not intentionally exclude newer parks, we visited only parks that my friend owns. I appreciated the fact that he acquires older parks and invests his money to enhance the quality of life for the residents. It takes time to have a positive impact and he is consistently working on improving the parks. You accurately identify the same difference between affluent neighborhoods, gated communities and lower income neighborhoods, not just mobile home parks. I was in several 55+ parks and they were a bit different to those that had no age restriction. One thing that I did notice was the pride for both private and communal areas in each. While the income levels of the more affluent parks provided more luxurious amenities, for the most part, there was no impact on the level of pride, care and enjoyment that I saw. Congrats on a wonderful article. I always knew photography was a hobby of yours. I think you can now add writing to that list of passions as well. Thank you Steve. I appreciate your kind words. I’m about 12 years from retirement. As of now, I’m 50/50 on “snowbirding” between Florida and northeast Ohio (with at least 1 of the abodes being a trailer), and selling all worldly possessions in favor of a nice, but not too extravagant RV. Call me the breeze. The latter can only happen with good health, so as with all things it’s “God willing”. 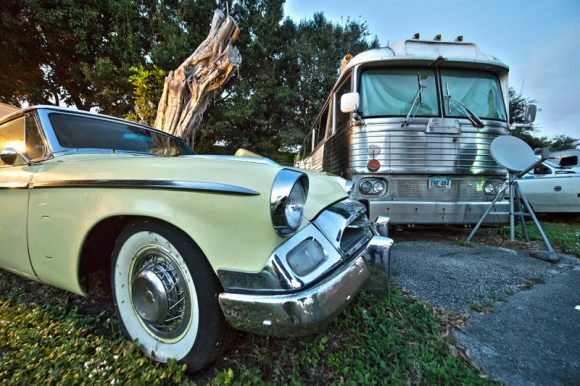 I talk to clients frequently who tell me they want to buy a classy RV and drive the country. This their dream retirement. The wander lust seems to grow with age. Regarding mobile home parks, the one off the main drag of Silicon Valley, El Camino at Las Robles must be the most valuable one in America. The 3 acre parcel has a bid of close to $50 million but the city of Pal Alto has not given the zoning for a high rise yet that the potential buyer seeks. So the park owner waits as his land of gold keeps apprecating while he rents his pads out to the few poor folks who live in the town. Trailer Park Boys, is not a Netflix production. The show, which depicts Bubbles, Julian, Randy and the rest in the fictional Sunnyvale Trailer Park located in Dartmouth, Nova Scotia. The show premiered in 2007 on Showcase Network. Also a Canadian network & production company. And we are proud of it, eh! It wasn’t until 2014 that Netflix started to air seasons eight & nine.